We were so excited to be part of Don and Steve’s wedding and reception after for so many years of building their lives together. For their small intimate wedding with their only their best friends and close family members, they wanted a smooth day with only the best food. In our initial meeting, we discussed all the aspects of their event desires including event schedule, table/chair rentals, table decoration, beverage options, service styles, and menu choices. Based upon the many event decisions, our planning team provided a comprehensive wedding event plan complete with accurate costs for their event. Pleased with the initial event proposal, the next step was to conduct a site visit to determine event logistics and evaluate the kitchen equipment. A complimentary site visit was arranged and wedding reception plans finalized. Silver chargers with black napkins on a medium grey linen with black chivari chairs set an elegant tone for this backyard dinner wedding reception. 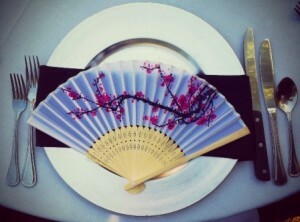 A client provided fan at each setting complimented the Asian theme of the house and yard. Instead of the typical dinner salad, Don and Steve selected a fresh dungeness crab cocktail in a martini glass to start the meal. 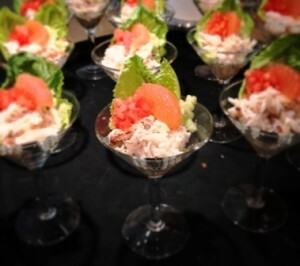 Sweet Oregon crab meat was served with ripe summer tomato, cucumber, a grapefruit supreme, and a drizzle of our chef made grapefruit vinaigrette. 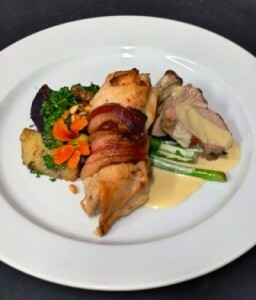 For this very special occasion, Voila Catering provided a plated meal instead of the buffet service or family style catering. 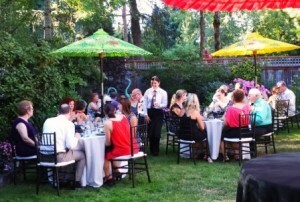 As an smaller wedding reception dinner, the staffing cost and food costs were almost identical…. 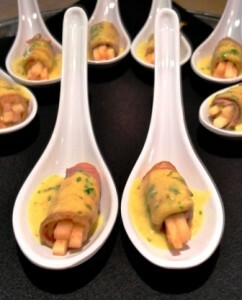 and the guests loved the elegant, restaurant style service! The first wedding dance as husband and husband! At the end of dinner, the Don and Steve enjoyed their first dance with live music and wedding cake. 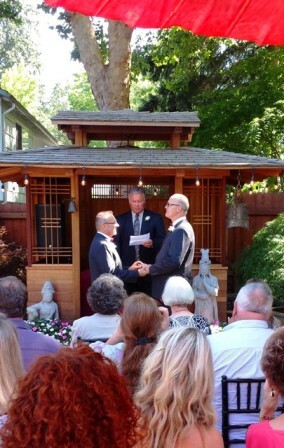 We are so pleased to have been part of their celebration of love at this backyard Portland Wedding Reception and wish them a long and joyful life together!